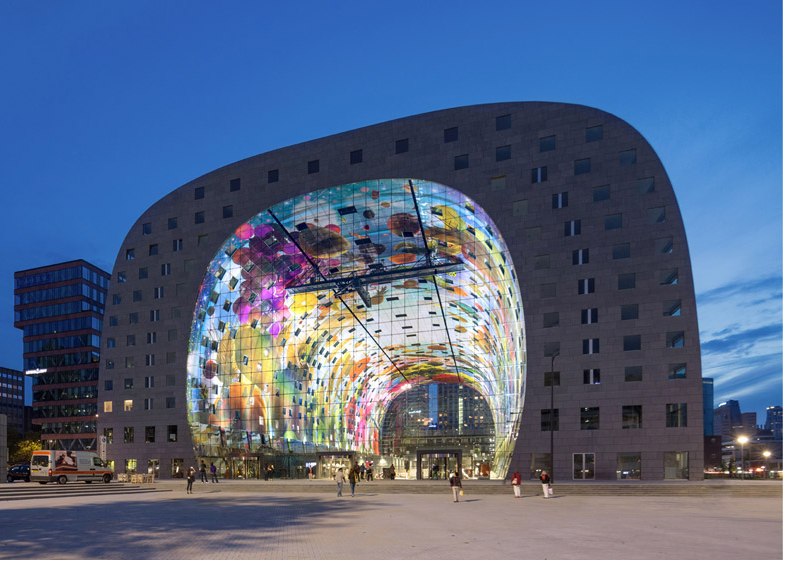 Rotterdam, a wonderful city in the Netherlands for design, has a new market and apartment building that takes up a huge block in the center of town. It is called the Markthal Rotterdam and it is a HUGE arch with market stalls on the ground of the inside of the arch and apartments in the arch. One of the truly beautiful elements is the colorful mural by artists Arno Coenen and Iris Roskam of fruits and flowers inside of the arch. Imagine how LARGE that mural must be! Giant-sized peas, carrots, eggplants and green beans cover the surface with square windows poking through. It is lively and full of color and different than most anything we have seen. MRDV is the architecture firm that designed this structure and they are famous for their unusual and unique buildings and structures. They are a Dutch architecture and design firm, who also designed the big tube building at Illinois Institute of Technology that we love so well. See it here.